Have you been working for large companies and ready to skip out on all the bureaucracy? Want the ability to control and drive your own ambitions? Or did you enjoy the small startup experience and have become interested in building your own business from scratch? You must know that choosing this path, especially the biotechnology and medical device route, will require drastic changes to your lifestyle and the standard 9 to 5 working hours will no longer be acceptable. This adventure is not for the faint of heart. Discipline and dedication will be required as you work yourself towards a profitable company. The following content will provide you a glimpse of what it takes to start up your biotech company. ​Make sure you have the correct type of licenses and permits for your business by visiting the U.S. Small Business Administration website. ​Do your research and decide whether you should form a limited liability company or incorporate your business. Based on your choice, your business structure will have different protection and taxation, so choose wisely. One big thing to note is that registering your business as a corporation does allow you to issue shares of stock. This ability will allow your company to attract investors for raising funds. Additionally, stocks act as an incentive for recruiting and keeping top talent employees within your company. Upon deciding on your business structure, assemble all required information and file them online at LegalZoom. Whether you have developed an actual product or simply created an innovative design to be implemented later, you must consider protecting this intellectual property via patent, copyright or trademark. This process could be complex and confusing. In order to simplify the process, you could contact IP agency specializing in these fields and have them assist you throughout each option. For example, these agency could help save you the time needed for investigating into existing patent's claims that may conflict with your idea. They will also verify that all the application papers are filled out and filed correctly. You can also look at the United States Patent and Trademark Office website to get an overview and frequently asked questions related to the patents and trademarks process. Keep in mind that international IP protection may vary greatly based on your application destination. Create a bank account for your business. It is important to differentiate your business finances from your personal ones. Banks may vary in its options and fees structure, so take a some time to check out the different choices. A website may not be crucial at first, but it is helpful for attracting investors and recruiting employees. At minimum, the website should have an introduction of your company, contact information and general information about key employees. To build a professional looking website without hiring an in-house employee or a contractor to deal with the website, look into Namecheap or Bluehost for your domain and website needs. Whether you are attempting to grow your company out of a “garage” or are ready to establish an office space, you will need to look at various options that would be suitable for your type of business and the number of people joining you on your venture. The following are cheaper alternative choices to renting out an entire office space for your startup. If your startup consists of a small group of employees willing to work from their home or at each other houses, and want to keep your expenses to a minimum, open a PO box. Not only will opening a PO box allow you to separate the company’s business mail from your personal mail, it also permits you to list a physical address in the company’s contact information without revealing your home address. A popular alternative and upgrade to the PO box is a “virtual office.” Specific locations will offer up the option to have a "virtual office" and the professional look that accompanies it for a low monthly rate that varies based on the options and package you choose. Benefits of utilizing a virtual office are being able to list your location's address at the building destination of choice, mail drop-off and pickup service, and the use of their conference room. Other package options includes having a person assigned to answer and forward voicemail to you and a receptionist, at the front desk, that will greet guests on days you are scheduled to use the conference room. Shared office space comes in different forms. As entrepreneurship spirit continues to grow, a new trend in business is to create a co-working environment and rent it out to small businesses or startups. These types of companies will provide you with a variety of options in how much space and what kind of amenities is accessible to you. For example, their rentable space options might range from a workspace with a desk, a cubicle and even up to a private office for your team. 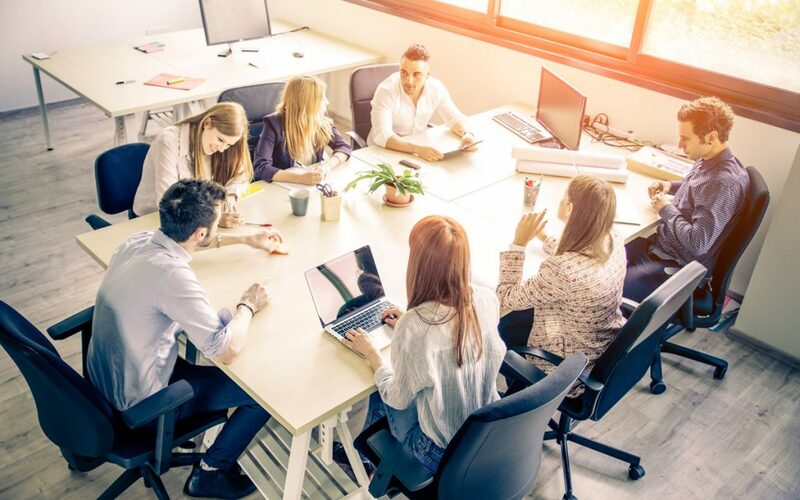 Another type of shared office space becomes available when a current business or startup decides they have more space than needed for their staff and are offering to rent out a section of their office. Both of these options are great when your startup team is small and it is not worthwhile yet to rent a large space of your own. A computer for each employee is a must these days, especially in the field of biotechnology. It may not be an immediate need as you just start your business, since each employee could rely on their personal computer. However, sooner or later, it would be best for everybody to have a computer dedicated exclusively for work-related activities, especially if confidential information is involved. A desktop computer will give you more bang for the buck if portability is not of great importance for the user. Desktop could be customized, or built from scratch, to leverage the better upgrade options for increasing the computer’s performance at a fraction of the price. Computer with high performance is exceptionally important for engineers. They may be responsible for developing 3D models and schematics for manufacturing and would need a powerful computer without consistently experiencing extreme lags during their project. Because startup works could be hectic, a laptop does allow you the flexibility of traveling with your laptop as well as working on those late-night projects at the comfort of your own home. Depending on the startup's stage of product development, you may find the following software suggestions helpful to your company. For constructing two- or three dimensional designs, Autodesk is a popular software that provides multiple applications to complete this task. The website link will provide featured different computer-aided design options that are free to try out. For developing animations, graphics and videos suitable for the company’s promotional material, try looking into Adobe Creative Cloud. This choice allows you to utilize the entire of collection of Adobe products for a low monthly rate, which is great if you do not want to commit paying for expensive software applications suited for only a specific function. GitHub is an attractive cloud-based software option, especially for managing coding projects, that is worth experimenting since it is available to try for free. GitHub grants users the ability to break projects into individual assignments, appoint those responsible for it and control what version are being worked on. To run your company without the headaches of having to keep up with the finances, you could implement software such as FreshBooks and Gusto to ease this situation. FreshBooks is all encompassing cloud-based software that deals directly with accounting issues like keeping up to date with the company's invoices and expenses. While Gusto covers payroll, and automatically deals with your business taxes at the state and federal level. DMS is an important topic to consider as it dictates how your colleagues collaborate, store data and share their work with each other. Having a server in your office and accessing shared data via local area network (LAN) is a commonly used method. Utilizing a server in-house enables your team to have faster operating speed as it does not require internet connection. In addition, it may be a safer option as shared content is only accessible within the office and through direct LAN connection. As technology around us continues to develop quickly, employing the use of a third-party cloud computing service has become a highly regarded alternative. This option is a cheaper option, in the short term, as it does not require the hardware, software and maintenance needed with an in-house server. Normally, implementing an in-house server will require hiring an IT specialist or paying for a consulting group devoted to the servers upkeep. The cloud computing service will ease this problem. Two popular choices for these services are Amazon Web Services and Microsoft Azure.